first tribal building to be certified LEED Platinum. A BOOK ABOUT ARCHITECTURE, REALLY GOOD ARCHITECTURE. 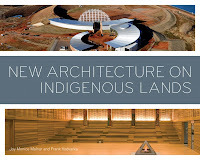 We found exciting things happening on Indigenous lands, especially since responsibility for new construction has increasingly been turned over to tribal authorities. Needless to say, these buildings are a far cry from the sort of structures that have been thought suitable by governmental agencies in Canada and the United States in the past. As clients, these tribal groups are clearly communi­cating their cultural needs and values to designers who are listening, and they are approving the final designs. It is an uneven sort of progress. British Columbia has, for example, enjoyed remarkable advances in the construction of new primary and secondary schools while the United States has not. Two questions emerge: What is the cause of this uneven progress? And, how, as seen in the examples presented in our book, did some tribal groups overcome the negative aspects of their situation to make progress? The causes, as one might imagine, are numerous and complicated. In the U.S. there are 564 tribal entities and in Canada there are more than 630 First Nations, eight main Inuit tribal groups, and five Métis governance structures. One fundamental view often noted by Native American scholars is that most of the treaties were not honored except for the parts that removed North American tribes from their homelands. In The Nations Within, Vine Deloria, Jr., and Clifford M. Lytle point out that it is “important to understand the primacy of land in the Indian psychological makeup, because, as land is alienated, all other forms of social cohesion also begin to erode, land having been the context in which the other forms have been created” (12). Thus any solution must, in the first instance, be land-based. But that alone is insufficient. Henry Hawthorn maintains that the dynamic quality of some of the newer schools is due in large degree to the presence of a remarkable architect, Marie-Odile Marceau. Marceau had served as project architect in the Department of Indian and Northern Affairs between 1985 and 1987, but in 1987 she became regional architect for Public Works and Government Services Canada, Department of Indian Affairs and Northern Development, to head up a school building program. She determined from the outset that the schools she was going to be responsible for would only be commissioned to first-class architects, and they would be remarkable. Recently Frank and I had the pleasure of touring the Place of Hidden Waters in Tacoma, Washington, with Annette Bryan, Executive Director of the Puyallup Nation Housing Authority, and design architect Daniel Glenn. Bryan has been preparing for this project since 2004 on many levels, from insuring a clean financial audit to educating the Board and Council to obtaining community input and involvement. Glenn’s Crow tribal ancestry coupled with his MIT education informs his design. While his buildings are beautiful, they are much more due to the specific cultural support they provide Native American peoples. Salmon bake area at the Place of Hidden Waters. It is an excellent example of compact development necessary to preserve the majority of the forested land. As we walked the site we caught a glimpse of the water hidden by the forest. Bryan explained how in order to respect the land they avoided the expedient developers’ method of bringing in a backhoe. They wanted to preserve as many trees as possible and minimize disturbing the natural topography. Removing invasive plants by hand was not cost-effective so they hired a herd of goats—an environmentally sound solution. It is the first tribal building to be certified LEED Platinum, the highest building certification for leadership in energy and environmental design. The Phase I Longhouse project was recognized by the U.S. Green Building Council and awarded the prestigious LEED for Homes 2012 Project of the Year. It is also one of six projects worldwide honored with a 2013 SEED (Social Economic Environmental Design) Award for Excellence in Public Interest Design. Of note, this project, which is an aesthetic, cultural and environmental success, was also built on time and on budget. Bryan made clear that the most important aspect of this project is that the people living here love it. The building is resonating. Joy Monice Malnar, AIA, is associate professor of architecture at the University of Illinois at Urbana–Champaign. 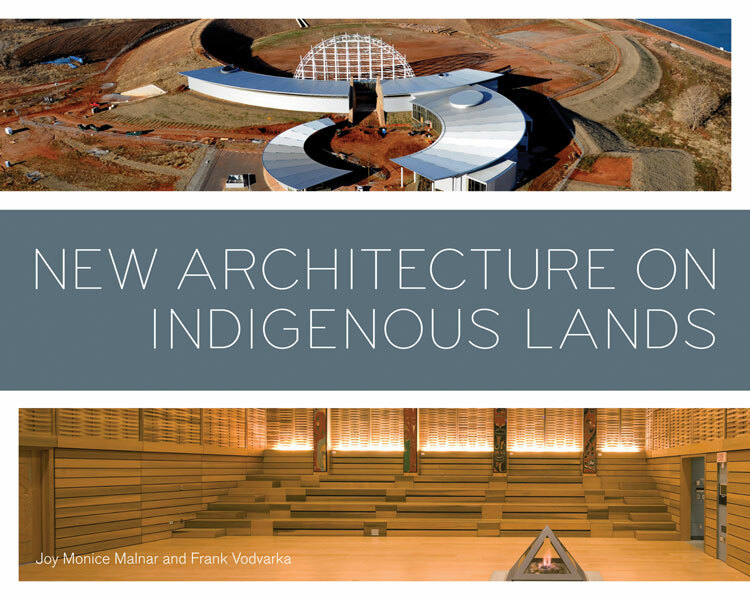 She and Frank Vodvarka, professor of fine arts at Loyola University Chicago, have coauthored New Architecture on Indigenous Lands (2013) and Sensory Design (2004). It is an excellent example of compact development necessary to preserve the majority of the forested land. As we walked the site we caught a glimpse of the water hidden by the forest.